So it's been a month of travels and this weekend I headed up north to the fabulous french city of Montreal. I read somewhere that Montreal is the second best city for food in North America, the first being San Francisco. WHOA, did I really just hit up both back to back? The first time I visited Montreal, the most memorable thing I ate was drunken poutine. And for those of you who aren't familiar, it's fries, cheese, and gravy. Let's be real, what's not to like? This time, I proudly managed to go beyond fried stuff with cheese, and discovered that Montreal is truly a food lovers paradise. A casual, sunny, more moderate sister restaurant to Torqué!, one of the top restaurants in the city. We went here for lunch and had the beef tartar with french fries, duck terrine (picture), and sausage in brioche toast. The first highlight of the meal was the duck terrine, which was super rich and flavorful. I liked that the terrine had nice big chunks of duck in it, which is a nice reminder that I was still eating meat. Complimenting the terrine are two perfectly grilled thick slices of brioche toast. I even enjoyed the sprinkle of sea salt provided on the side. The second highlight of the meal was the french fries that accompanied the steak tartar. 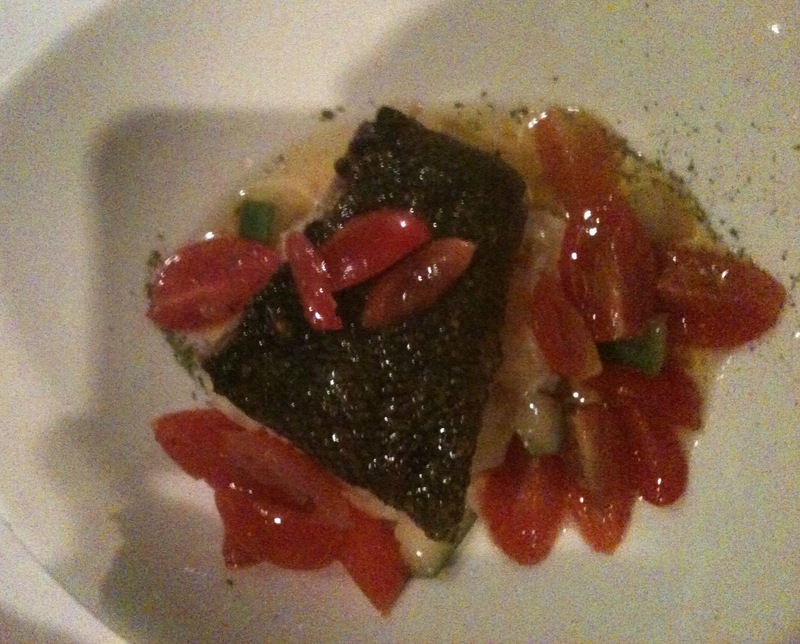 The steak was perhaps a little too tomato-y (yes, that's a word). But the fries were so fresh and tasted as if the potato had just been dug up and sent to the fryer. There's no seasoning on the fries because you just don't need any, that's how GOOD these potatoes were! While on a search for restaurants, I started seeing Pintxo come up in various discussion forums and it seemed like a great spot. Pintxo is a intimate restaurant in the Latin Quarter that serves an eclectic mix of "gourmet" tapas. To say that I'm a big fan of small plates is an understatement. I truly think that it's the most enjoyable way to eat, and it doesn't have to just be spanish tapas. In writing this, I realize this is almost like food attention deficit disorder, because I am always asking "show me more! what's next!?" (assuming of course that the tapas are good). I read alot of reviews about the tapas+main course tasting menu, but decided to forego that so we could try out all the delicious sounding tapas. It can be overwhelming to choose tapas, which is why it was awesome when the waiter offered to create our own tasting menu with 10 plates. I believe my reaction to his offer was something along the lines of "YESSSSS!" Here are some of the highlights from the meal. I apologize the pictures aren't great as I took these with my phone instead of a real camera. Calamari with onion confit: The large calamari rings were nicely seared and tossed with a sweet and smokey onion confit...deeeelicious. 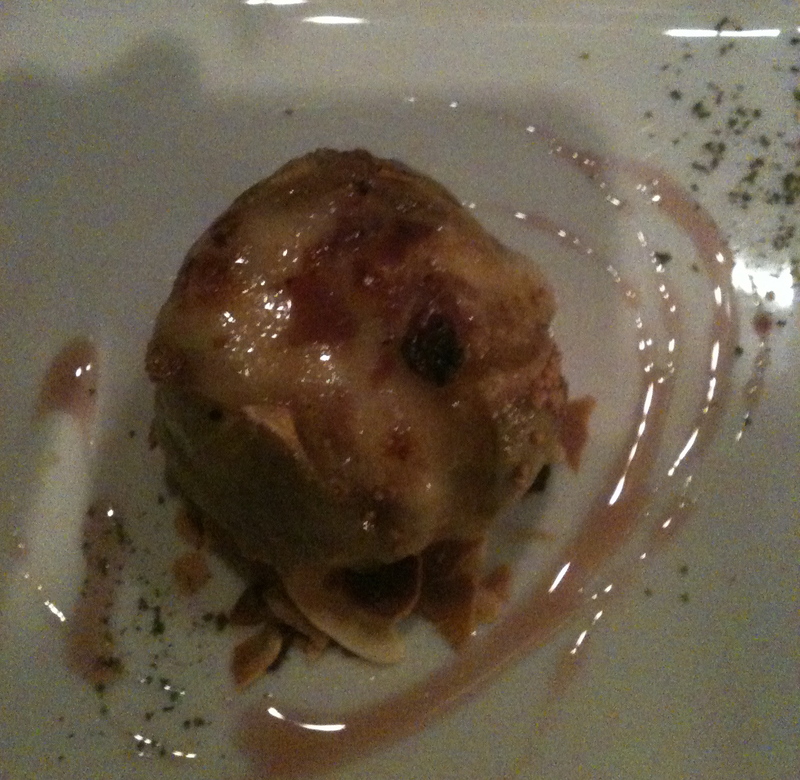 Fig stuffed with ham and mahon cheese: My favorite of the meal! Fig is stuffed with serrano ham and manhon cheese, which is a sharp and tangy cheese. It's baked and topped with some toasted almonds, a sweet sauce that I can't remember, and fresh black pepper. This is the first time I've ever had stuffed figs and I was really impressed by it's unique flavor, a perfect combination of rich, sweet and salty. The rest of the meal was equally delicious with highlights including foie gras with grilled onions, blood pudding with apple chutney, braised beef cheek, and much more. 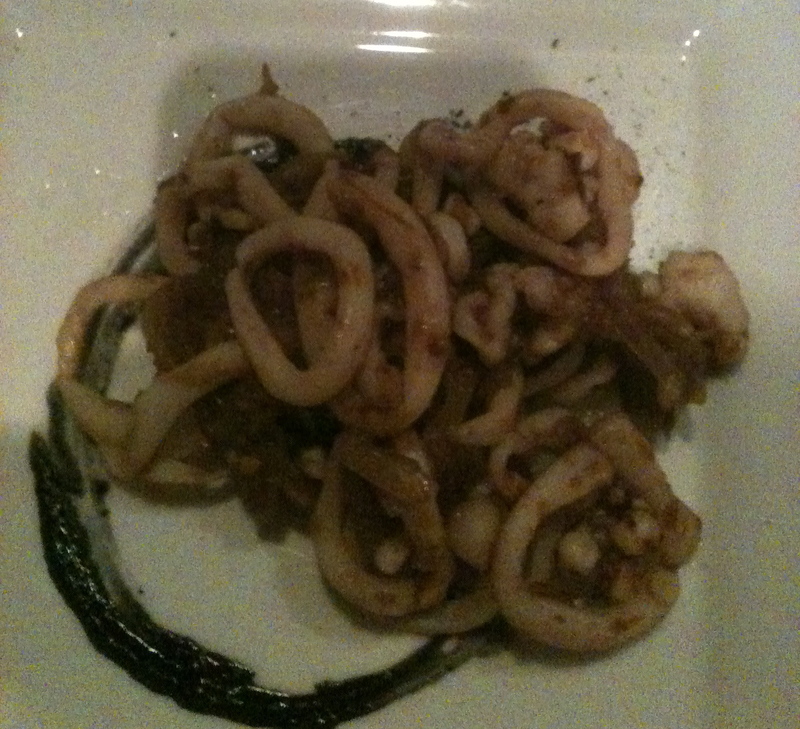 Pintxo totally surpassed my expectations, and I am sure it will surpass yours too!